You and I tend to know February 2nd as Groundhog Day, but it’s been a festival day for a long time, and its roots go back deep into the calendar of the Christian church, and far deeper still. The day marks the midpoint between the winter solstice and the spring equinox, so it’s considered the beginning of spring, or at least (if you live where it is still remarkably cold, like I do) the tipping point where winter and dark begin making way for warmth and light. Candlemas is rarely observed in the church these days, but our old hometown of Ripon, England still honors the day. 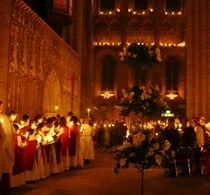 The cathedral hosts a Candlemas service in the evening, and the cathedral is lit by thousands of candles. To clarify–it is lit by thousands of candles only. It is brillliant. The first time I walked into one of these services, my children in their winter pajamas (they were young, and it was late and cold out), we all gasped and immediately whispered “Harry Potter!” This is the best way I know to describe the look of the cathedral to a Candlemas novice or a wizard fan–think of Hogwarts’ great hall and its floating candles. In Ripon Cathedral, the thousands of candles are set around the edges of the ground, in the clerestory ledges, and in every shelf and cubby along those ancient stone walls. They appear to float and rise. It’s heady stuff, and it’s one of the most beautiful sights I’ve ever seen. Candlemas is one of the most ancient feasts of the Church, and occurs 40 days after Christmas, on the 2nd February. It is also known as the Presentation of Jesus at the Temple, in reference to the episode in Luke’s gospel (2:22-40). This ancient festival has been celebrated at Ripon for centuries. A visitor to the Cathedral in 1790 declared that the whole building was “one continued blaze of light all afternoon”. 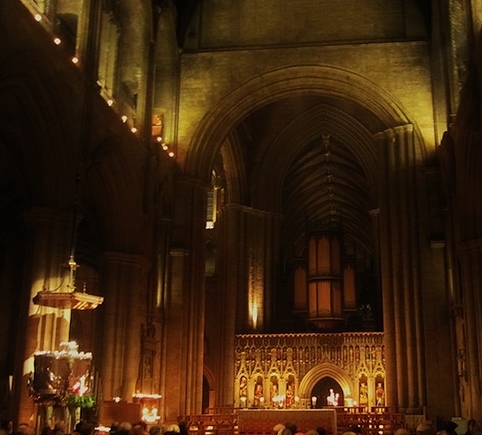 This year, the Cathedral will once again shine with the light of thousands of candles, symbolising Jesus as the light of the world. It’s good to know that, dark and cold as it still is (whether we are speaking of the weather and season, or of world events), we can look to a tipping point and the hope of spring. (Even if Punxsutawney Phil is right and the next few weeks will be chill, spring must come some day.) It is also good to know that, in a world of cultural globalization, where McDonalds is edging its way into every corner, you can still stumble on those few enclaves where something ancient, unusual, and beautiful will make you catch your breath. . . even if you find yourself whispering “Harry Potter” in the aftermath.